I have always loved reading blogs, way before I even started my own. It was sort of like my favourite hobby to me. I just loved getting into bed with a good ol' cup of tea and binge reading all my favourite blogs. Ever since starting up a blog of my own and being more involved in the whole blogging community through social media, I have come across a huge variety of new bloggers that I now seem to fan girl over. Of course, there is other blogs that I follow on social media however these 7 are the ones that I usually tend to read pretty much everyday. My best friend and a fellow blogger all in one, what's not to love? Seriously though, when it comes down to blogging this girl knows exactly what she's doing. 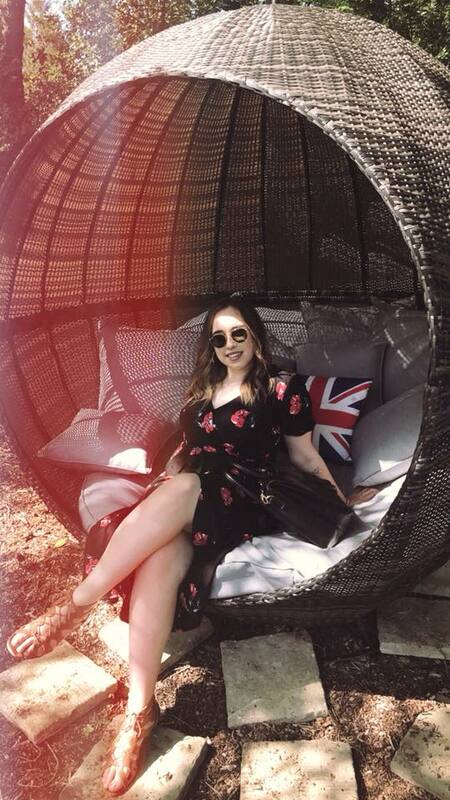 Taylor has a great variety of Beauty, Fashion, Lifestyle and Travel posts which are all very well written and has great photography to go with it. She's also amazing when it comes to creating makeup looks, she's just pure makeup goals. My favourite posts of hers would have to be her travel ones and also her recent 'Makeup Inspired by a Film' which I thought was such a creative and fun idea to do, if you'd like to check them out then I highly recommend you head over to her blog. This beautiful lady was one of the first bloggers that I quickly became obsessed with. Her blog consists of a variety of topics such as: Beauty, Fashion, Lifestyle and some great Blogging Tips. Whenever I get the dreaded writers block, I am constantly finding myself heading over to her blog for some inspiration as she has a whole series of blog post ideas for those who needs a little bit of motivation and I think it's just fab. Her photography is amazing also which is always a great thing, I get so excited over the quality of her photos. This blog is run by the gorgeous Kathryn who writes Beauty, Fashion & Lifestyle posts. I want to first talk about how fab her blog layout is, it's so pretty and so easy to navigate around which is always a plus. I love everything about her blog, however my favourites are her outfit posts, the photography is always so pretty and also her sense of style is gorgeous. I seem to love every single outfit she wears. 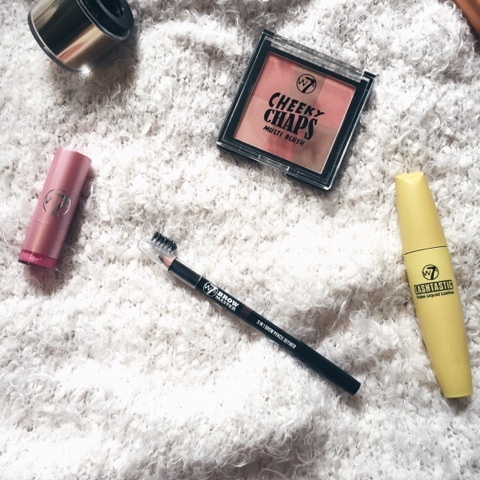 A feature on her blog which I think is very cool, is the 'My Beauty Cabinet' where Kathryn rounds up a bunch of her favourite high end and drugstore products all onto one page for you guys to shop them, amazing right? Such a pretty blog name am I right? Lauren is another one of my favourite Beauty, Fashion & Lifestyle bloggers. She writes some amazing product reviews on a variety of makeup and skincare, she also has posts all about the monthly Glossy Box's. Each of her posts are all beautifully written and the photography is stunning. She has recently written a post all about what girl power means to her and it's quickly become one of my favourite posts ever. Check her blog out! This blog is without a doubt, one of those blogs that I find myself typing into my URL every single day just to read her posts over and over again. I find Erin's photography very unique and pretty, I do love the wooden background she uses, makes the photo's seem a bit shabby chic! Erin is a 'makeup obsessed mum' and by the way, her son is the cutest! Her lovely blog consists of product reviews (which are my personal favourites to read), hauls, product empties and so much more. She's also one of my favourite people to watch on snapchat too. From her product reviews to her guide to perfect brows, Sarah knows what she's talking about. She's a Beauty and Lifestyle blogger, who has such creative photography skills. 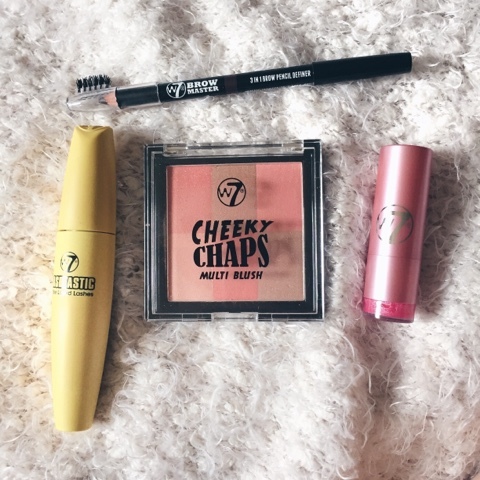 My favourite posts from her blog would have to be her 'maybelline week' posts where she reviewed brand new Maybelline products everyday for a whole week (p.s. Sarah, you need to do another one of these). She's a very lovely blogger with a great sense of humor, she has lots and lots of great blog posts so I'd highly recommend you check her out. 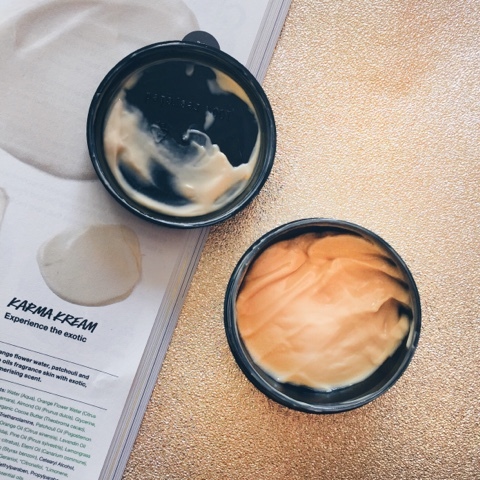 This blog is run by the gorgeous Alex who talks about makeup, skincare, hair care and even has a variety of Lifestyle posts also. She is pure eyeshadow goals, seriously, she is amazing at eyeshadow and always seems to have a gorgeous glittery eyeshadow on! Each post is very well written and has a lot of detail to them. I love reading more of her chatty posts as well, my personal favourite is her 'I'm a Blogger, so I'm stupid right?' - I definitely recommend checking that out. She's such a lovely, down to earth person and I find myself always checking through her Twitter to see if any new posts have come up. 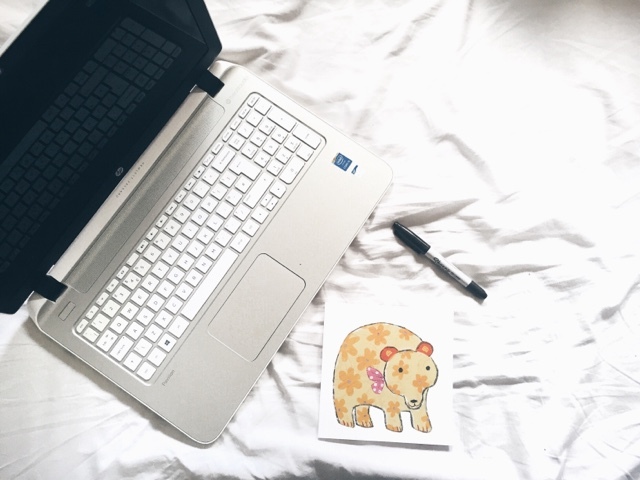 I'm always on the hunt for new blogs to read, what are your favourites? 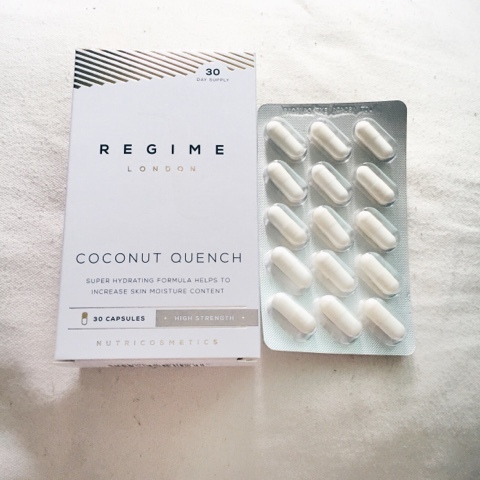 As a person with dry skin, I'm always looking for ways to improve it and I love trying out new products which obviously means I was very excited when Regime London got in touch with me to see if I'd like to try out there new Coconut Quench* capsules. • Hyaluronic acid helps to significantly increase skin hydration (facial and whole body) after just 3 weeks of use. • Each serving contains the equivalent of 4000mg of fresh coconut water. • Helps to improve some of the damage caused by cosmetics, making it easier to apply make-up. Just after a few days of taking these capsules, I started to notice a difference in how my makeup was applying to my skin. It was going on a lot smoother. I normally have a lot of texture and dryness around my jaw line which can make my foundation look a bit bumpy and uneven, however that seemed to completely disappear after a few weeks! I found that I haven't been needing to use tons of moisturiser everyday as my skin would already be healthy and glowing, just a tiny bit in the mornings sorts me out for the whole day. This product has also managed to calm down a lot of my redness on my cheeks and I find that I don't have to use my green primer as much anymore. With just one capsule a day, I know that I have everything I need to make my skin feel and look healthy. I feel a lot better and more fresher when taking these as I know I'm getting great hydration into my diet. I would highly recommend this product to everyone. This product retails for £19.99 in Superdrug. 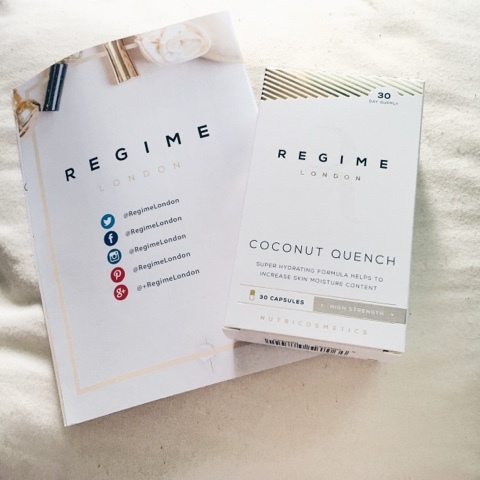 You can find Regime London here. What's your go to skin care product for dry skin? I've had this product for a few months just sitting in my drawer completely unopened. I came across it again a few weeks ago and luckily it was still okay to use. When it comes to my bath time, I usually use a body scrub and then a body wash & a lotion, I've never thought of using a body conditioner in my routine but now I feel like it's a holy grail product that I like to use every time I shower/bath. What exactly is a body conditioner? 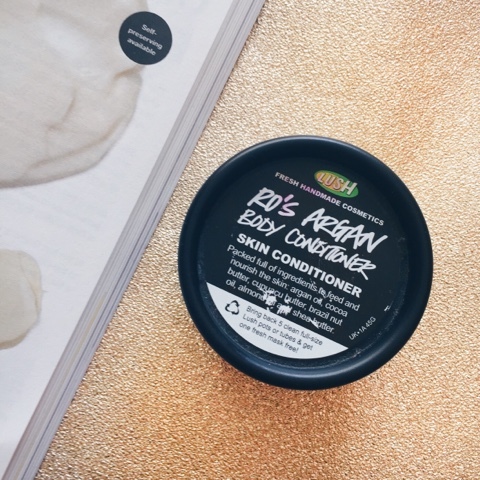 According to Lush, a body conditioner basically works the exact same was as a hair conditioner except this one is for your skin. You smooth this over damp skin and massage in, then simply rinse it off with warm water to achieve perfectly smooth and hydrated skin. This product has a gorgeous floral scent to it which isn't too overpowering yet leaves your skin smelling amazing after every use. 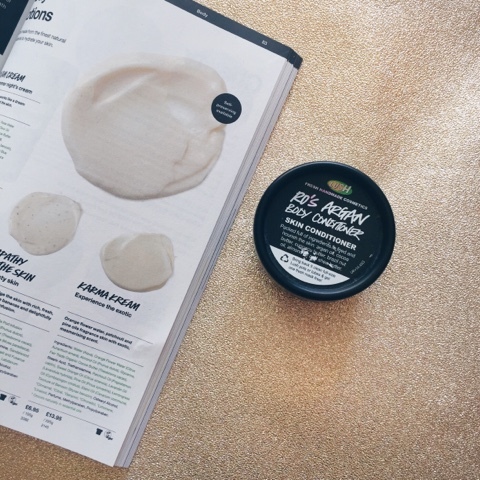 In this product Lush have use nourishing Argan Oil, which is thought to have anti-aging properties as it's rich in Vitamin E and essential fatty acids. This also includes Brazil Nut and Almond Oils as well as Cocoa, Shea and Cupuacu butters to leave your skin supple and radiant. My skin has never felt so smooth and hydrated before ever. You only need the tiniest amount of product as a little goes a very long way with this one. I love using this for shaving my legs as they end up feeling a lot more hydrated afterwards. This product retails in Lush stores and online for £16.50 for 225g or £27.97 for 500g. 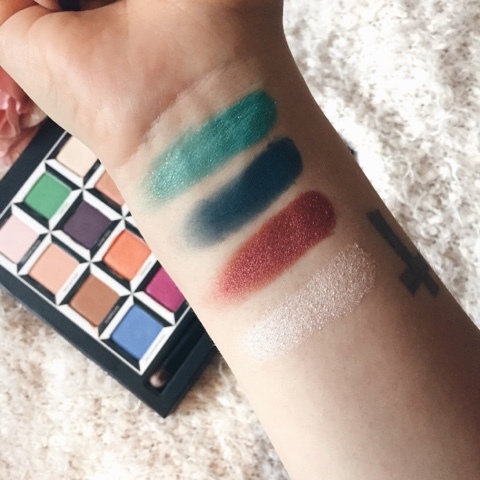 I am very excited about this post mainly because I am super happy and in love with this eyeshadow palette. 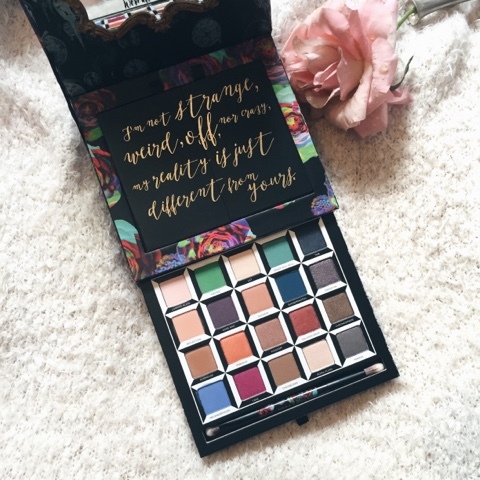 A few weeks ago I entered a Twitter giveaway by the beautiful saysallymay where she was very kindly giving away this Urban Decay Alice in Wonderland eyeshadow palette. I recently got a message from Sally telling me that I won which was very exciting considering I never win anything haha! Within a few days, my palette arrived and it's all I've ever been using since. Let's just start off by saying how visually beautiful this palette is. 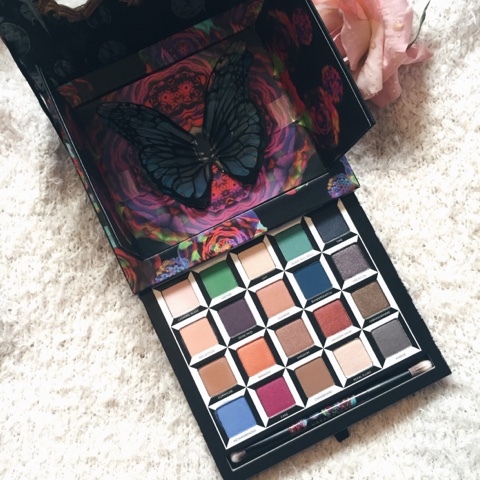 There are so many colours and so much detail, the outside packaging is decorated with colourful kaleidoscope pattern and also has a mix of butterflies and flowers. As you lift the lid up you've got a small mirror with the quote "We're all mad here" and then also a quote on two lift up doors that says "I'm not strange, weird, off, nor crazy, my reality is just different from yours" - Once you lift the two doors up you are greeted with a 3D butterfly. I feel like a lot of time must've gone in to get this packaging, it's without a doubt the most prettiest eyeshadow palette I own. 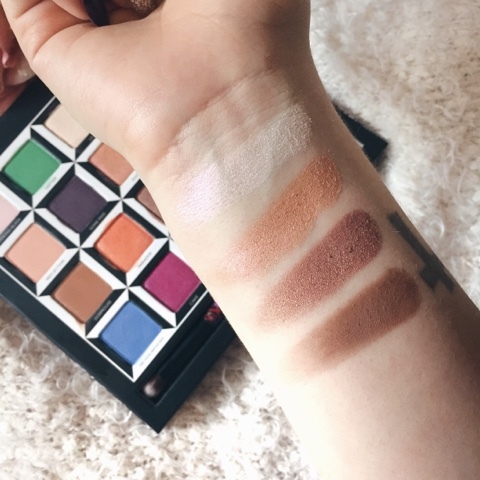 The actual eyeshadows are revealed by pulling the bottom drawer, the palette comes straight out for easy application and use and it slides straight back in when you're finished with it. 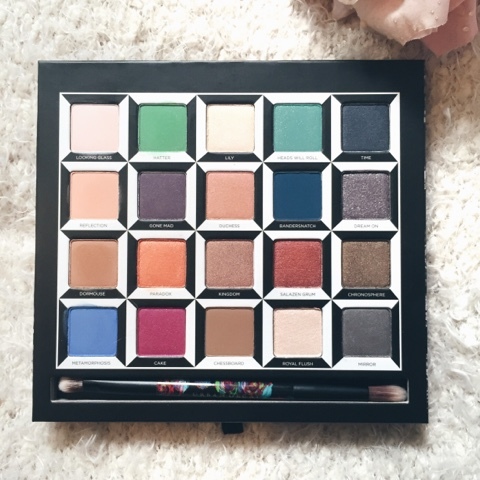 The palette contains 20 eyeshadows which are all organised in columns, each column inspired by a character from the movie Alice Through the Looking Glass. The first column is Alice, second is Mad Hatter, third is Mirana (the white queen), fourth is Iracebeth (the red queen) and lastly is Time (a character in the film who is part human, park clock). 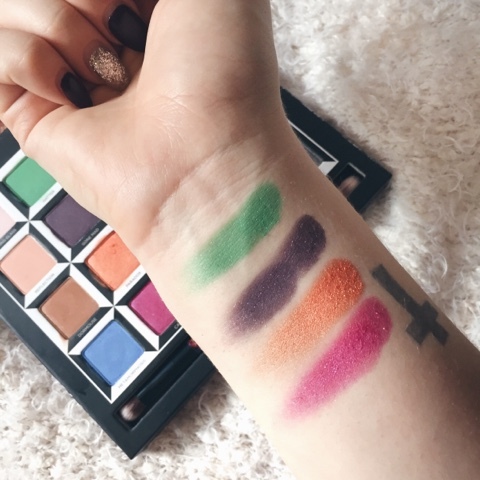 Each eyeshadow is extremely pigmented and they each have a velvety texture to them which makes blending a lot easier. 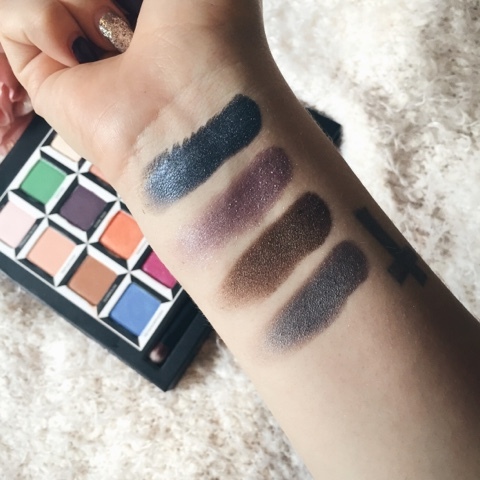 The staying power is great and these shadows last all day on my eye lids without creasing or smudging when using a eyeshadow primer beforehand. The palette includes a double ended brush for the perfect application and easy blending. The palette retails for £43 and you can purchase it here. 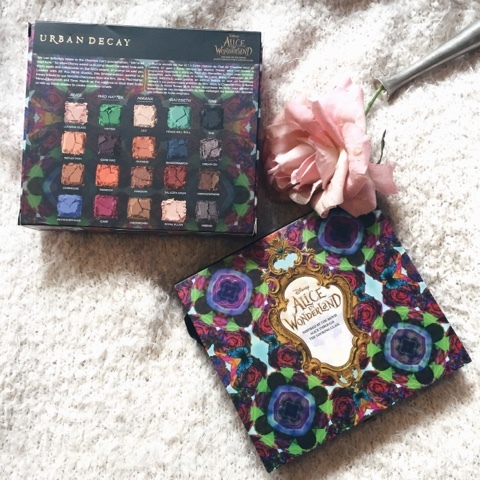 What's your favourite Urban Decay palette? 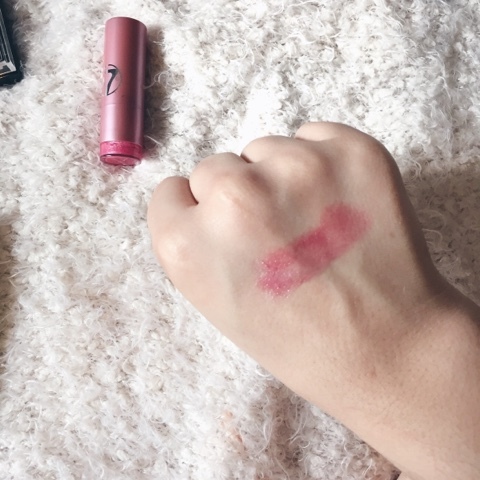 When I first started wearing makeup, I seemed to lean towards the more cheaper products such as those foundations that were too orange for me, the bright pastel coloured eyeshadows that looked awful on me as I didn't know what blending was back then and those awful lipsticks that felt like wax on my lips. I feel like the world of makeup has changed a lot and these days we have more choices to play around with to achieve the looks that we want without spending ridiculous amounts of money. Nowadays, drugstore brands are creating products that have the same pay off and quality as some higher end brands. W7 Cosmetics is a prime example for this. Their range of products are very affordable yet still manage to give that incredible pigmentation and quality. 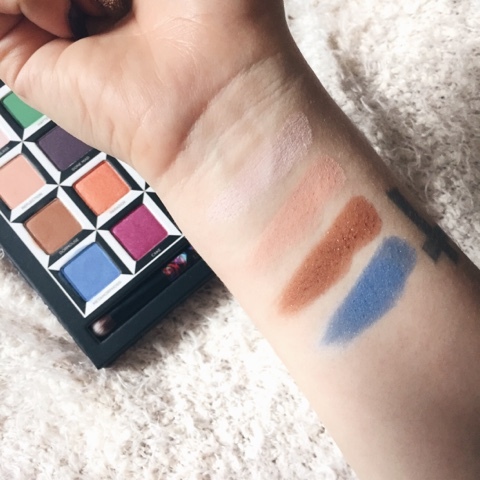 W7 created their famous eyeshadow palettes which are dupes for the Urban Decay Naked palettes, they're very popular as it means you don't have to spend £30 for a high end palette when you can pay £9.95 for a dupe that works pretty much the same. I was very excited when W7* sent me some of their products to try out and review, let's just say I was very impressed with these. This blush is stunning. It's a multi colour blush therefore has a variety of different shades as you can see in the picture above. Some shades are more matte and some have more of a shimmer to them which creates a gorgeous highlighted look on the cheeks. When I first used this, I think I underestimated just how pigmented it was. I used so much on my brush which was a big mistake as this product goes a long way, it's highly pigmented and the formula feels smooth and silky which makes it easily blendable. Can we also just take a moment to appreciate how gorgeous the colours are? 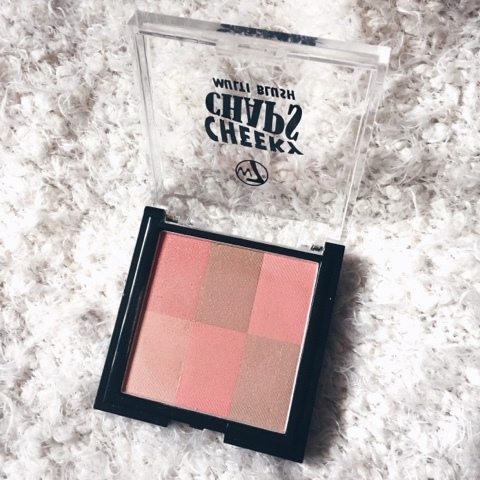 This blush retails for £5.95. I never normally use a brow pencil to fill my brows in with as I sometimes find them to stiff and waxy to use. This was the complete opposite with this product. It's a 3 in 1 brow pencil therefore you get the brush to comb through your brows, you get the pencil to fill them in and you also get a clear wax on the opposite end to keep the hairs in place. If I'm honest, I'm not a big fan of the wax but I think that's mainly due to the fact that I prefer to use a gel to set my brows in place. On the other hand, I am simply in love with this pencil. It glides on so smoothly and the formula of this is very creamy which I love. I use this to outline the shape of my brows before going in with a pomade to fill them in, I also like to lightly use this at the front of my brows to gently create little like hair strokes where my brows are the most sparse. This retails for £4.99. I wouldn't class this as a pigmented lipstick, as it's more of a sheer lip tint on me. The pink packaging is absolutely beautiful and very unique to anything I own, same goes to the lipstick. The shade is gorgeous, it's a sheer baby pink shade and has a lot of shimmer to it. I personally wouldn't wear this shade on it's own as I don't normally go for pinks as they don't suit me however I have been playing around with this to try and make it work and I've found a solution which I have been doing for the past few days. I put on my regular lipstick for the day and then I take a bit of this shimmer lipstick and apply it on top to give that metallic lipstick effect which is on trend right now. I like using a dark brown liquid lipstick for this as I feel like it gives the best effect and it's a whole lot cheaper than purchasing your own metallic lipstick. This retails for £3.50. I honestly think I've found my new favourite mascara. This mascara has a thick barrel wand with short bristles so you can create that perfect voluminous look. The bristles do an amazing job at separating the lashes whilst still managing to curl them nicely. You can also use this on the bottom lashes to create a dramatic effect and it also doesn't smudge underneath your eyes which is always a good sign. I believe this is one of the cheapest mascaras I have tried yet it works absolute wonders and I will probably be re-purchasing this as soon as it runs low. This retails for £4.95. Have you tried any W7 Cosmetics products? When I was younger I used to read books all the time. Mainly it was the Jacqueline Wilson books because come on, they were amazing right? As I've gotten older, I seem to spend more time on social media rather than getting stuck into a good book. I read The Fault in our Stars a few years back before the film came out and I absolutely obsessed over it that I ended up reading it all over again a few months later. That book made me realise how much I love and miss reading. 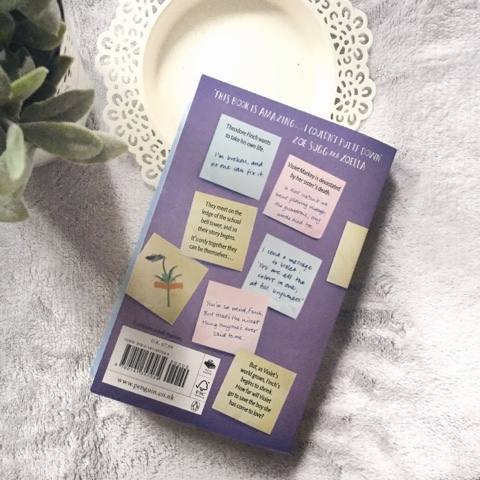 Zoe Sugg, mostly known as Zoella posted a video a while ago about her new book club with WHSmith's and she showed us a few of her favourite books that she enjoyed reading. 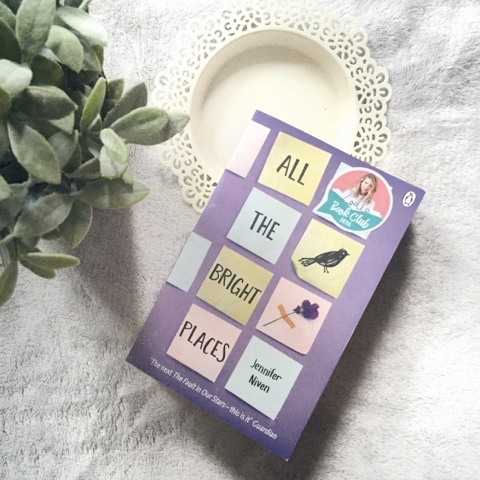 The one that caught my eye the most was All the Bright Places by Jennifer Niven as I've seen many people go on about how great this book is and I've also read some really good review about this one. I jumped on the band wagon and purchased a copy for myself. I'm going to try my very hardest not to give any spoilers away for those who haven't read this book yet. The story follows the lives of two very different characters: Violet Markey and Theodore Finch who both go to the same school. The story starts off with them meeting on top of the bell tower from school, both wanting to take their own lives for different reasons. Violet is still grieving over her sister's recent death and Theodore has depression (a mental health disorder). They both pair up together on a school project to discover the 'natural wonders' of their state. The story shows how their friendship grows, how Theodore falls in love and how he can only be himself around Violet, whilst it also focuses on their family life at home and how both characters have very different background to one another. If you've read and loved The Fault in our Stars then you will without a doubt love this book too. It's really an amazing young adult book which will make you laugh, smile and cry. I do recommend having some tissues with you because I did shed a tear or two. I managed to read this book in 2 days, it was one of those that I just didn't want to put down. The book is filled with great quotes and inspirational life lessons that I found it impossible not to come out of this without feeling a bit of inspiration about life. What's your favourite Young Adult book?